Not in Rochester, NY? See below for a list of the counties we service. The European Starling is a very noisy, and smart bird. 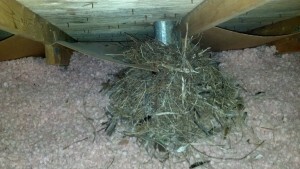 These birds tend to be found nesting in Dryer vents/bath vents, eaves, broken fascia boards and attics. Most homeowners do not even realize they have a problem until they hear the birds themselves or notice the large amount of foul smelling dropping along the siding of their residence. 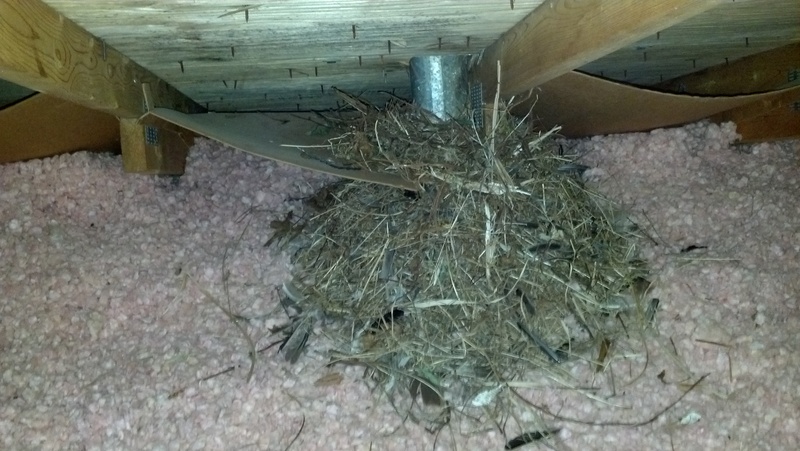 Large starling nest in a attic. Starling Prevention starts with removing artificial food and water sources (bird seed, grains). If you or someone you know is feeding the starlings, try to persuade them to stop. If possible remove the nest by hand, if possible. Then seal the entry hole. Seal all openings that are bigger than 1″ in diameter. Many materials work: metal, wood, glass, masonry, galvanized 1/4″ hardware cloth, and plastic or nylon netting. Having a chimney cap is always suggested. Other methods such as Electric shock devices or bird spikes may be needed. If trying to keep them out of a building or barn hang 10″ wide vinyl or rubber strips over open doorways (with no more than a 2″ gap between strips). Or to prevent roosting in your sheds, barns, garages, hangars, and warehouses, staple 1/4–1″ polypropylene netting to the underside of the roof beams. Most starling houses and buildings around Rochester, NY and the surrounding cities and towns do not have guards over dryer / bath vents. 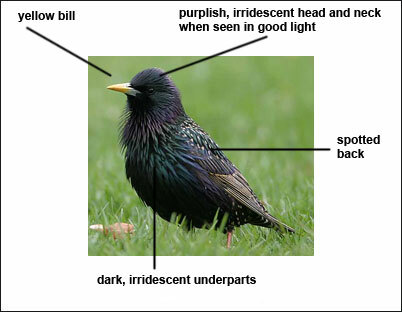 This are the areas that starlings really tend to nest. They can flip the louvers open on the vents then nest in the duct itself. This not only can cause a fire (dryer vents especially) but you may also notice small bird mites coming in from the vents themselves. To remedy the vent situation we typically fill clean out the vent duct (if its not damaged) or replace it. This is done after the birds have been removed. Then depending on your style of vent it is either replaced with a similar vent with a guard attached to it or we can add a animal guard over the existing vent. If you live in or around Rochester, NY and have problem with starlings or other birds do not hesitate to give Eviction Nuisance Wildlife Control a call today @ 585-330-8786 and schedule a inspection today.